A protective single chamber ball of air with handles inside and shoulder straps to enable you to have fun control. 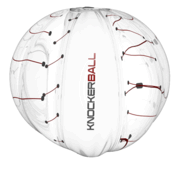 Slam in to another Knockerball opponent and never get hurt. OK, there is some pain involved; the pain in your sides from so much laughter. Don't forget to practice some rolling and flipping. Get knocked off your feet, You're Out!